Excuse the long post title. Since high school Saturday nights have been my time with my mom. If you talk to me for all of 5 minutes you will probably learn how close I am to my mom and my family. So Saturday nights have always been kind of special for me. My sister and my dad have worked on Saturdays since high school days so it has always just been me and my mom. Since you may know back in the day I was a notorious dieter I often preferred to do my own thing when it came to meals. It was rare I actually ate what everyone else was eating for dinner and even to this day my family’s meals and mine are not often alike. Except when it comes to Saturdays. To say my mom is supportive is an understatement. When I wanted to lose weight she helped me measure my chicken every week and every Saturday night for as long as I can remember we would have chicken stir fry. In perfectly measured portions. Then I moved on to my vegetarian stage and Saturday nights meant a lentil loaf, or omelets, or veggie burgers. Now things are a bit different. I’m a little more go with the flow when it comes to my meals but Saturdays are still fun. My mom and I are the “healthy” eaters in my family so Saturdays often means lots of veggies and protein and because we both love shrimp it usually means shrimp. So this recipe is a hybrid of my phases, the stir fries, the veggies, and the shrimp. She and I made this for dinner this past Saturday and it was perfect. But even more perfect was the company I ate it in. Saturday nights will always be my favorite and won’t ever be complete without a little bit of “mom” time! Warm a skillet over low heat with your olive oil. Scramble your egg in the pan and cook until done. Remove from the skillet. Next saute the shrimp in the same skillet until cooked. Remove from the skillet. Lastly saute the vegetables until cooked. Once your veggies have cooked add in your ginger and garlic (this will prevent it from burning). Next back in the shrimp, egg, and pineapple and let simmer over low heat. 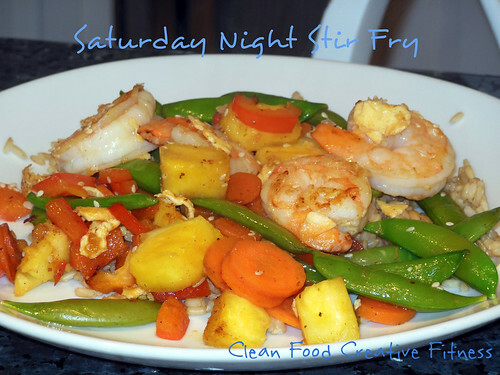 In a bowl combine your coconut aminos and sesame oil and then pour over your stir fry. Saute a few minutes longer. Gluten Free Version over Brown Rice. Do you have any family traditions you look forward to?? 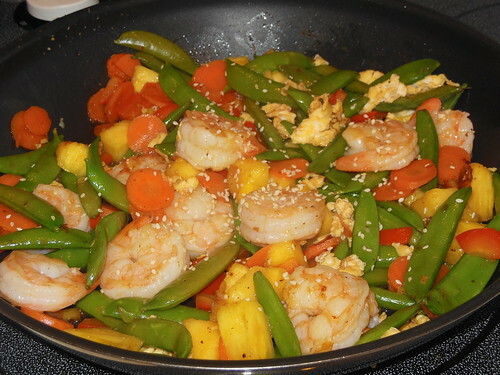 This entry was posted in Recipes and tagged gluten free, paleo, recipes, stir fry, vegetables on February 1, 2013 by danielle. Oh I LOVE this. Especially the exotic touch with coconut and pineapple. And I love that you spend your Saturdays with your Mom. Momtime is the best!! My Mom and me travel a lot together. We go away for long weekends to a city or a nice place around in Europe and it is always a blast. That’s so awesome! Mom time really is the best! Shrimp is one of my favorites! On a stir-fry just makes it that much better. Family traditions are so important–what great memories! We used to have “Friday night pizza” nights when I was growing up. I think it was a way to end the week without my Mom having to cook–my Dad would pick up pizza on his way home from work. As kids, we loved it! I always find traditions like this fun too and you always remember them! Hahaha healthy or not totally fine! This sounds AMAZING. I can just imagine the tastes in my mouth right now and I wish I had it at 7:54 am! Seriously can’t go wrong with stir fry of any kind!! I loveeee shrimp and I’ve been craving it but i’m so scared to make it at home. I don’t think i’ll cook it the whole way! It’s actually really easy to cook. It changes color when it’s cooked too so it’s really easy to tell! I love the addition of pineapple to this dish. The sweetness of pineapple in Asian-inspired dishes is the best. It really helps balance out the flavors of the veggies and the sauce. Awesome recipe :). Thanks Hannah! I love putting pineapple in savory things too. Always gives it a great touch! It sounds and looks fabulous! I just love mom nights!! I love that you got to have ur mom to yourself every saturday night! I love that you’re so close to your mom My mom is seriously my best friend and I have to talk to her daily and see her at least a few times a week. Sunday night family dinners are kind of a tradition around here… Everyone seems to be super busy during the week, so Sundays are the days we spend together and catch up. Sundays have always been a family day for me too. That’s so great that you are so close with your mom too! Aw, I love that your Mom is so supportive! I can definitely relate, my Mom is totally my best friend. Ha, I still feel like a kid sometimes. We don’t have any Dinner traditions, I guess because I eat completely different meals than them, plus we live separately. But I just love catching up with her and knowing she’ll always be there. Stir fries are always perfect for those meals you want quick, but healthy! I totally agree too my mom is definitely my best friend! I totally love that you paired this recipe with a family story especially since it’s one you know I can relate to!! My weeknight dinners w/my mom are so special. We are both the “healthy eaters” in the fam too. This dish is something we’d love! She and I are going out to dinner together tonight. I can’t wait for us both to get seafood! That’s too funny that us and our moms are so alike! Mom dinners definitely are special! Beautiful! Both the recipe (all the variations of it) and the story. Thank you for sharing this bit of your special relationship with your mom. I’ve made a stir fry like this before, and it’s always delicious! I just add the shrimp after the fact for my bf and I eat the veggies (with tofu or whatever else I’m cooking that night). Mmmm I should try making this with scallops, I have the rest of the ingredients! Aww I love how Saturday nights are your time with you mom! I wish I lived in the same city as my parents so that I could do that. Also this stir fry looks awesome. I love pairing shrimp and pineapple together! Thanks Chelsea! I’ve always wanted to move somewhere warmer but would have such a hard time away from my family! I really enjoyed reading this story about you from your childhood. Your mom sounds like such a wonderful lady <3 Have a GREAT weekend. Thanks Jessie! She really is wonderful! That’s so sweet, its so important to spend quality time with your family! I am drooling right now over that dinner, looks so good! <3 <3 I love my Danielle time too!!! So proud of you my sweets! The flavors in this look sooo good1 I love pineapple with ginger and red peppers. Defnitely needs to happen in some form this week! My family (cousins and all) still eats Sunday dinners at my grandparents’ house. Love it. Maybe we’ll make a stir fry soon. I love that you and your mom share a Saturday night dinner tradition! I’m super close to my mom, too, however she lives across the country, so instead of eating together, we share recipes with each other on a weekly basis. I love that we can now bond over food (it used to be an uncomfortable point of contention during the years I was restricting)—it’s nourishing both physically and emotionally. 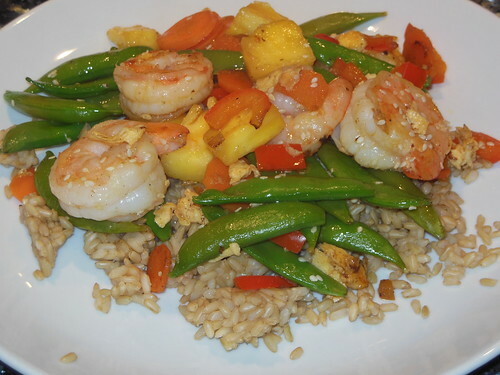 This shrimp stir-fry looks delicious, fresh, and healthy. Love it! I can’t remember the last time I made a good stir-fry, but you’ve inspired me to change that. That is so sweet you have mom nights!! That stir fry looks good. I just can’t get myself to eat shrimp… I don’t know why! Thanks Brittany! It took me a long time to like shrimp too. It’s still the only seafood I will really eat!